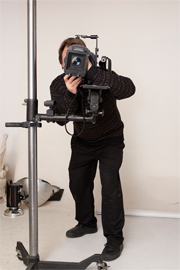 For over 125 years we have been striving to give our customers the highest quality photography possible. Special attention is given, even to the smallest details, to make our customers, and subject matter look great. Four generations ago, our legacy as a portrait studio began, and has carried on strongly to the present. The third generation, Ken Cook, and the fourth generation, Jason Cook, are working together as one of the few father-son photographic teams in the country. At Cook's, we are skilled in all types of photography, and utilize techniques handed down from one generation to the next. The techniques we use date back to the old masters. Ken Cook has perfected these techniques, and in turn has passed them on to Jason Cook. When you're photographed at Cook's, there are several advantages that our customers have come to enjoy and expect. Each client is treated as if they were our first and last customer. Through lighting, the most flattering combination of highlights and shadows are selected for each person. After the actual portrait's are taken, the work is finished in our own lab. There you can rest assured that your film will be developed by our own hands, and that extreme care will be taken to create the perfectly color balanced and exposed prints. There are two artists on staff to bring our customer's complexion's to perfection. The finished product can then be framed, by our staff, in one of the many gallery quality frames we have to offer.